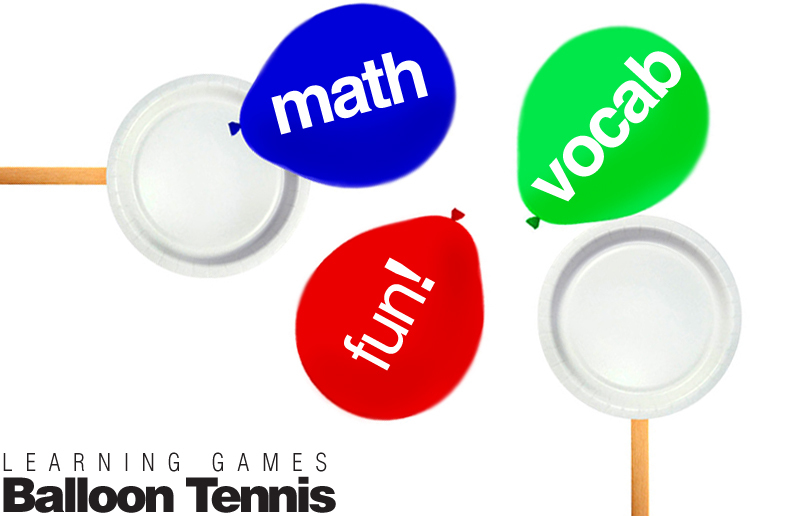 Balloon Tennis - Glue paper plates on popsicle sticks for a racquet. Kids hit balloons and play tennis! Synonyms - Two player game - Kids are given a word. They hit the balloon back and forth. Before they hit the balloon they have to call out a synonym for the word. If they can't, their opponent gets a point. Sight Words - Write sight words on balloons. Kids whack the balloon and say the sight word. If they have the correct answer, they get a point! Spelling - Spell out a word and hit the balloon for each letter. Kids can do this solo, with a buddy, or in a group. Fractions - Three player game - 2 people hit the balloon and one person keeps track of the score. Kids choose how many chances they get to hit the balloon. Limit kids to a certain number. Otherwise, they'll go on all day, and everyone needs a chance to play! If they miss, they get to continue, but they have to start off from where they stopped. For example, if they plan to hit the balloon 20 times and they stopped at 6, they start counting at 7. The kid keeping track of the score tallies each time they hit the balloon. As soon as they reach the maximum number they stop (which is hard I know!). As a group, they figure out the fraction. For example, the balloon was kept in play (or smacked) 18/20 times. Basic Addition - Two Players - Have kids count up their points!